Enjoy a riding holiday at this country Castle estate, with its lovingly restored 17th century castle, is on the Tuscany Umbria border, close to Lake Bolsena. It has been in the same family for generations and once a favourite summer retreat of the young Pope Pius XII, this estate makes a wonderful holiday base. Daily rides take you to the hilltop town of Onano, past ancient Etruscan tombs, along the infamous Brigand’s Path and to the shimmering crater lakes of Mezzano and Bolsena. You can visit the fortified towns of Sorano, Proceno and Pitigliano, There is a sand school for lessons, or you can just relax by the pool, play tennis, taste local wines, try a thermal spa or enjoy a cooking lesson! Perfect for families, riders and non-riders, this estate is a magical and peaceful retreat in the heart of Italy. There is great flexibility at this estate – the ride programs are aimed at reasonably competent riders, who are secure, comfortable and in control of a horse at a walk, trot and canter in open country. Other programs are more flexible and novice and even beginners can be catered for with lessons in the sand school. The horses have been carefully selected, according to their attitude and breed, to match the guests different levels. The trail riding suits confident novices and above, but beginners may take lessons in the arena. The horses are a mixture of Thoroughbred and Warmblood crosses, and local Italian crosses, varying from 15hh to 17hh and also one or two children’s ponies. They are all well-schooled, responsive, willing and enjoyable to ride and are very well looked after. The horses are kept in paddocks in the 100 hectares surrounding the castle. Tack is English style. Riding helmets must be worn and a packing list will be provided when you book the ride. Rides are usually limited to a maximum of 5 guests. On the specific riding programs, there is generally 2 to 5 hours riding a day, broken with rests and a long lunch. There are two large sand arenas available, with one arena used mainly for the flat work and the other larger arena is used for show jumping. At the opposite side of the castle they have created a 2000 metre cross-country course with beautiful wooden jumps and soft reliable ground. A week of riding in the enchanting countryside between Tuscany, Umbria, and Lazio. 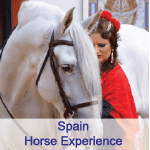 Beautiful horses and experienced guides will lead you every day on a fantastic ride across one of the less inhabited Italian country sides. Beautiful nature and also a lot of history surround the estate, with castles and archeological sites framing the view. The old trails used by the “Brigands” (outlaws) to escape from the law 200 years ago provide a fantastic opportunity to explore this beautiful area on horseback, just as they did! Although there is always some flexibility. The itineraries below are examples of standard 7, 4 and 3 night stays – but please note they are just examples and routes and daily arrangements may be varied in your guide’s discretion if weather, local conditions or circumstances require. If you wish to do less riding or swap rides out for lessons (novice to intermediate level) this is also possible. Daily timetables also vary a little with seasons – in spring and autumn riding is later in the morning; in summer there is an earlier start with a longer rest in the middle of the day (and full day rides not usually possible if it is very hot / in peak summer months). Contact us at info@snaffletravel.com.au or on Tel (+61) 03 5428 6061 for further information and answer any questions. Accommodation is based at the estate. The old farmhouse in the grounds of the castle, has been converted for guests and there are several apartments, a dining room and swimming pool. All accommodation is in twin/double bedrooms which have an en-suite. The food is freshly prepared and authentic. Expect lots of pasta dishes and other Tuscan style cuisine, with a chance to try many of the local specialities. Breakfast is at the castle. Lunch and dinner (three to four courses) is usually eaten at the estates taverna. Lunch can sometimes be a picnic brought to meet you out riding. The ground floor of the farm house opens onto the main terrace, which overlooks the main swimming pool. On the ground floor, there is a large “taverna” with brick vaulted ceilings. The space is divided into three main areas: dining room, billiard room, ping-pong room, plus a large kitchen available for all the guests and equipped for cooking courses. Please note due to constantly fluctuating exchange rates, prices are quoted in Euros and we can provide an Australian dollar rate based on the ANZ bank sell rate. Rates are subject to currency fluctuation until the final balance is paid. Please contact us for the most up to date pricing. Please check with us as sometimes specials maybe available. All meals as per itinerary 7, 4 or 3 nights. During the ride you will enjoy sightseeing. The property has a swimming pool, bikes to hire, tennis court, cooking classes on offer and a spa nearby. Golf and Boat hire can be also arranged. If you do not have a car, sightseeing excursions with a car and driver can be arranged for an additional cost. The closest airport is Rome and the closest train station is Orvieto train station. Transfers can be arranged for an extra charge. We also recommend hiring a car from Rome. Please ask about other activities of which there are many available from the estate.